For my husband’s 4oth birthday, we were lucky enough to spend a weekend in Minneapolis’s most luxurious and most booked hotel right in the heart of downtown Minneapolis, The Loews Hotel. We found ourselves surrounded by dozens of Minneapolis’s best attractions all within walking distance of the hotel. Although we are both Minnesota natives, we had yet to experience so many of the amazing attractions that draw people to Minneapolis every year. To get a glimpse into what we did, saw, and experienced on our trip check out my list of the 20 downtown Minneapolis attractions within walking distance of the Loews Hotel! 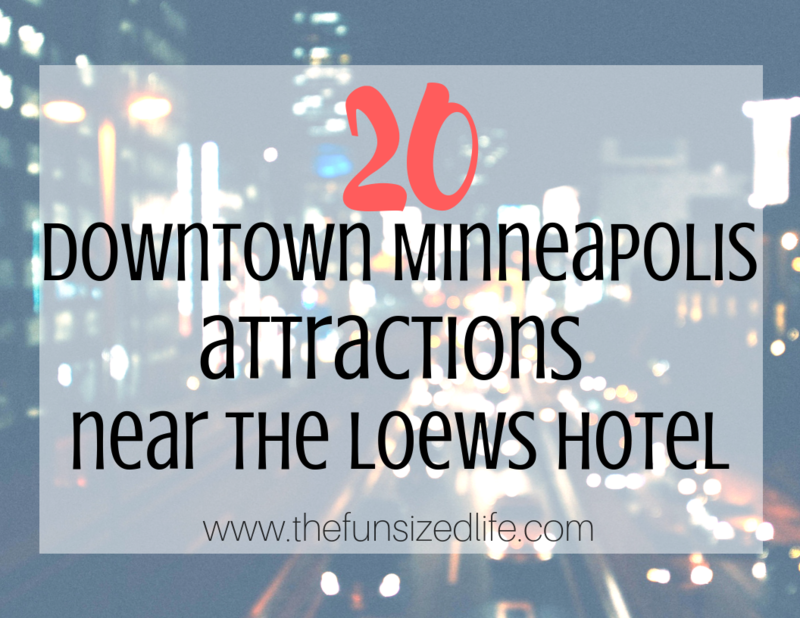 *This post was sponsored by the Loews Hotel and Meet Minneapolis. The Loews Minneapolis Hotel is located in the heart of downtown Minneapolis and they have clearly catered to the wide range of business and leisure travelers who come through their doors. Not only was Starbucks adjacent to the lobby, but the Loews small gift shop also had delicious treats for purchase along with handcrafted coffees. Apothecary Bar and Lounge – This charming little section of the hotel has quite a charming and intimate feel. Like having dinner with friends. This makes sense seeing as how they specialize in shareable plates, handcrafted cocktails, and local microbrews. Cosmos Restaurant – If you’re hoping to have a home cooked style meal, Cosmos offers new American Cuisine for breakfast and dinner. Releve Champagne Lounge – Now this is my kind of bar!! At Releve you can get handcrafted Champagne cocktails in addition to small shareable plates. No matter what your style or your taste, the Loews Minneapolis Hotel has all the food and dining experiences you could ever hope for from downtown Minneapolis. In case you don’t believe me, keep reading to learn about their latest culinary venture. Minneapolis has seen major growth in its culinary scene over the years. Because of this, Loews Minneapolis Hotel wanted to partner with local culinary artisans in order to give guests a taste of local culture. Based on the success of the Loews Miami Beach Hotel program’s success, this innovative idea is now in Loews Hotels across the country. Mademoiselle Miel – These gourmet chocolates use local honey and maple sugar to sweeten their treats. Mademoiselle Miel strives to help protect the honeybee population and collects honey from over 30 beehives located on rooftops throughout Minneapolis. Baker’s Field Flour & Bread – Minneapolis is well known for it’s Mill City Museum. Baker’s Field Flour & Bread is bringing stone milling back to the Mill City! They specialize in baking naturally leavened bread and use locally grown, organic grains. The Herbivorous Butcher – Let me tell you, as a former vegetarian, I was thrilled to see this name on the Flavor Minneapolis list. This one of a kind vegan shop is the first one in the entire country. The Herbivorous Butcher works to deliver vegan meats and cheeses while maintaining the flavor and taste of the real thing. As I said, part of what makes the Loews Minneapolis Hotel amazing is that it is in the heart of downtown Minneapolis. That means many Minneapolis attractions are within walking distance of the hotel. If you are planning a trip to Minneapolis soon and are hoping to avoid too much car travel, I have compiled a list of 20 different downtown Minneapolis Attractions in walking distance of the Loews Minneapolis Hotel. The Target Center is a multi-purpose arena in downtown Minneapolis that hosts major events all year long. If you’re hoping to catch a sporting event or concert, chances are you can find it here. The Walker Art Center is one of our family’s favorite places to go throughout the summer and fall months. There is a beautiful, unique sculpture garden available free of charge (plus parking.) You can spend the whole day outside exploring the sculptures or head inside the museum for more amazing artwork! Close to Target Center, Target Field and US Bank Stadium the City Works Eatery and Pour House have over 90 craft beers to choose from. If you’re in Minneapolis and a Vikings fan, make sure you head to City Works for their Vikings watch parties! I am kicking myself for missing this statue during our stay. Located at the Nicollet Mall, the Mary Tyler Moore statue stands in memory of Mary Tyler Moore herself and her famous sitcom that was set in Minneapolis. If you are looking to really get in on the music scene in Minneapolis, First Avenue is the place to go. First Ave. has been around since the 1970s and continues to host venues that cater to everyone. If you don’t want to go in for the music, just stop by for the famous stars painted along its walls. Naturally, the most photographed star being the late, Prince. The Basilica of St Mary is a Roman Catholic church that has it’s very own block in Minneapolis and takes up 2 acres of land. Originally built in 1871 it was the first Basilica established in the United States. This former cineplex now hosts concerts and movies with dancing and a full bar. There are several different sections to the Skyway Theater so whether you want an intimate location, great cocktails, fun dancing, or a great show, the Skyway has it all. With the largest farmer’s market in the area, the Minneapolis Farmer’s Market is open year-round with winter limited winter hours. There is also more than just great fresh produce here. You can purchase from local vendors of all different types and even get yourself some great snack foods and fresh lemonade. Yes! That amazing vegan restaurant is still within walking distance of the Loews Minneapolis Hotel! This family-owned meat and cheese shop has perfectly perfected their completely vegan recipes while still maintaining texture an flavor. The Nicollet mall consumes over 12 blocks of downtown Minneapolis and is the shopping and dining district of the city. It is also surrounded by several of Minneapolis’s most notable buildings, the IDS Center, Orchestra Hall and the Hennepin County Library. Probably my most frequently visited theater in downtown Minneapolis, the Orpheum hosts modern shows in a beautifully restored theater. From comedy shows to concerts, to the best off Broadway musicals, the Orpheum has it all when it comes to entertainment and beautiful architecture. Hell’s Kitchen is Minnesota’s most booked restaurant. It’s actually been around longer than Gordon Ramsey’s famous TV show (which I didn’t know!) Thought many people thought this restaurant was named after the famous chef, this fiercely independent, award-winning restaurant doesn’t need any help. Stop in just for their amazing mimosa and Bloody Mary bars. I took full advantage of the mimosa bar and loaded up with coconut toasted marshmallows, fresh fruit and just for show (since I’m gluten intolerant) poppy seed mini muffins. Target Field is now home to the Minnesota Twins baseball team but you can also occasionally catch the Minnesota Gophers there as well. Not long after it’s opening in 2010 they also began putting on outdoor concerts in the stadium. Another one of Loews Minneapolis Hotel’s Flavor Minneapolis contributors is also within walking distance of the hotel itself. As a gluten intolerant person, I can really appreciate the Baker’s Field Flour & Bread’s strong desire to craft quality artisan bread. True, healthy, organically made bread is hard to come by these days and they’ve decided to bring it back to the Mill City. When first opened in 1921, the State Theater was considered to be one of the most advanced with the first air conditioning system in Minneapolis. The original stag was even made of glass. While the glass stage is no more, the 6 original chandeliers still remain as well as the murals on the walls. While most city halls aren’t anything to be too excited about, the architecture of the Minneapolis City Hall is truly what draws people in. It was built in 1888 and has a clock tower with a clock face larger than the Big Ben clock tower in London. As a former photographer, Mill Ruins Park was always my go-to location for fun outdoor photography shots. You can explore the Milly City Museum or spend the day outdoors exploring the ruins. The ruins from some of the local flour mills are plainly seen right next to the Stone Arch Bridge. This bridge is a former railroad crossing and the only arched bridge made from stone that spans the width of the Mississippi. With quality sourced ingredients and an award-winning wine list, Crave is a perfect place to spend a night out with the one you love, or an intimate group of friends. The sushi available is flown in fresh daily in order to assure the freshest sushi available. If you love diving into the new craze that escapes rooms, you’ll be happy to hear that there is one close by! Located in Nicollet Mall. You have 60 minutes to examine clues and work together to escape the room. This is a perfect way to spend a day with a workgroup, friends or family. Love fondue? Then this is the place for you! With a wide range of chocolate and cheeses, the options seem endless and is a great way to have some laughs and connect with a group of people. I know downtown Minneapolis has a lot to do and see and while I tried to cover the highlights, I know I’ve left some things out! Feel free to leave a comment below and share your other Minneapolis favorites and let me know what you think about the Loews Minneapolis Hotel!